Can I go abroad, how long can I go for, what happens if I’m ill while I’m away and can I combine a holiday with chemotherapy sessions? These are just some of the common concerns that patients with ovarian cancer tend to ask their doctor. Typically it affects those over the age of 50 – although it’s important to note it can strike women at any age. Just this month Angelina Jolie hit the headlines after having her ovaries removed at the age of 39 due to a health scare. And hot on the heels of Ovarian Cancer Awareness Month, Staysure spoke to GP Victoria Barber, who lost her mum to the disease and is now a big supporter of the UK based charity Target Ovarian Cancer. The 49-year-old has been working as a GP for 20 years and is based in Kettering, Northamptonshire. We had a chat with her to find out what women with ovarian cancer should be aware of when travelling or booking holidays. 1. Can you give us any advice for a first trip? Plan it well: speak to your oncologist, cancer nurse and GP, take their advice about when is a good time to go if you have had surgery or chemotherapy. Make sure you don’t have too frantic an itinerary; you may be more tired than you’re used to and need to pace yourself. Above all, remember it’s not impossible to travel and to have a great time even if you have ovarian cancer. 2. Are there any precautions women should take before a holiday? Establish your safest time if you’re having chemo. Ovarian cancer is often treated by cycles of chemo and you may have neutropenia and therefore be more prone to infection at different times in your cycle. Your oncologist will be able to help you with this. If you’re traveling in the UK, you can potentially have treatment at any local NHS clinic or GP surgery whether it is an emergency or not. If you need ongoing injections etc., these can be arranged with another hospital or facility in advance. If you are traveling abroad, the European Health Insurance Card entitles you to the same treatment as a resident of the European country you’re going to and does cover ongoing health problems. Injections and treatment are also possible on this card. It doesn’t cover medical repatriation though. Obtain a copy of your medical summary; your GP can provide you with a print out. Hospital letters can be useful too. Most clinics send you copies automatically after your appointments or these can be obtained from your surgery. Consider translating any important information into the language of the country you’re going to. From the 1st of April 2016, you can register with your GP to access your record online. You will need a password and you will be able to see your summary record. This will list your medication, medical problems and allergies. You may be able to see your consultations, hospital letters and full test results depending on what your GP’s arrangements are. Vaccinations need time to create immunity and should be discussed with your practice nurse as soon as you’re planning your trip. If you are having chemo, you are unlikely to be able to have live vaccines e.g. MMR or yellow fever. But you can still have inactivated ones e.g. Hep A, although they may not work as well. Ovarian cancer is associated with a higher risk of Deep Vein Thrombosis. Travel over four hours on a plane or restricted coach etc. is riskier. You can have heparin injections to counter this and you should also speak to your oncologist. Flights too soon after surgery can cause a change in intra-abdominal pressure, check with your surgeon. Anaemia as a result of chemo can cause shortness of breath. Oxygen levels drop at altitude. If you are considerably anaemic and need oxygen, you can travel but check with your oxygen supplier and your airline. Make sure you have valid travel insurance that includes repatriation in case of illness. It may be worth you taking antibiotics with you if you are immunosuppressed. You may have to obtain a private prescription for these from your GP if they are specifically for travel. Have a travel kit for over the counter medications for diarrhoea, travel sickness, temperatures etc. During your holiday wear comfortable, loose clothes for travel. The typical ovarian cancer operation scar benefits from loose clothing with elasticated waists, which help lower the risk of DVT. If you’ve had lymph nodes removed, you are at risk of lymphoedema. Your cancer nurse specialist should be able to help you with special stockings. Make sure you keep hydrated as this reduces your risk of deep vein thrombosis. Avoid water or ice unless it is bottled and/or you know its source. Don’t go barefoot to avoid cuts to feet and infection risk. If in doubt, take a thermometer and check your temperature is less than 38c if you’re worried about infection. Carry identification (such as a passport), insurance card and brief medical notes around with you. A medic alert bracelet or necklace with a summary on can be useful. 3. Are there any countries that women with ovarian cancer should avoid travelling to? 4. How long can women with ovarian cancer go on holiday for? If you have finished treatment for ovarian cancer and are in remission, there is little to stop you going for as long as you want. If you are having chemo, you may need to time it with your treatment cycles. Or travel within the UK and have treatment pre-arranged at local clinics. You could go on a world cruise, but remember the NHS will only give you three months of medication. If you are going for longer than three months you may have to get more privately or arrange a special licence with the Home Office if you need to take large quantities of controlled drugs e.g. morphine. 5. 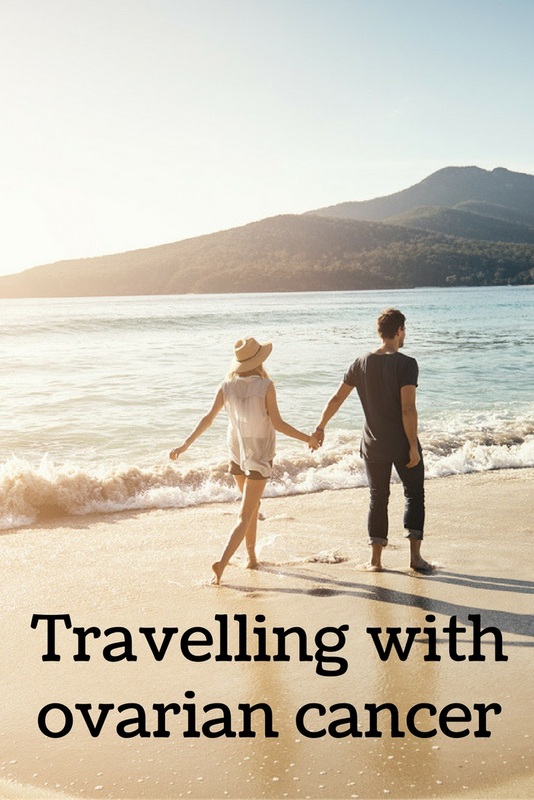 What tips can you offer for women travelling with medication? Always take a list of your medication with you. Ask your GP for a print out. If you need injections or liquids, carry a letter from your doctor with you confirming what they are and why you need them. You will be able to take more than 100mls but do check with the airline. you have the generic names, not the UK trade names of the drugs. Make sure you order them from your doctor in good time and take a few more days’ worth in case of travel delays. You should also keep them in the original packages and put some in your hand luggage and your main in case a bag gets lost. 6. Are there any activities that people with ovarian cancer should avoid? 7. In general, does ovarian cancer restrict people enjoying their holidays? Planning and being sensible with your destination as laid out above means that all eventualities have been covered and you can get on with enjoying yourself. It is really important not to see ovarian cancer as a giant millstone stopping any aspect of normal life. It’s perfectly possible to go away on holiday and most people do. Further advice can be obtained from www.targetovariancancer.org.uk or Macmillan.